Writing now in the spacious back room of Depot Coffee, a coffee place in Hopkins, Minnesota that (as name indicates) used to be a railway station. Thirteen of us are writing around a big table, racking up word count and drinking coffee. 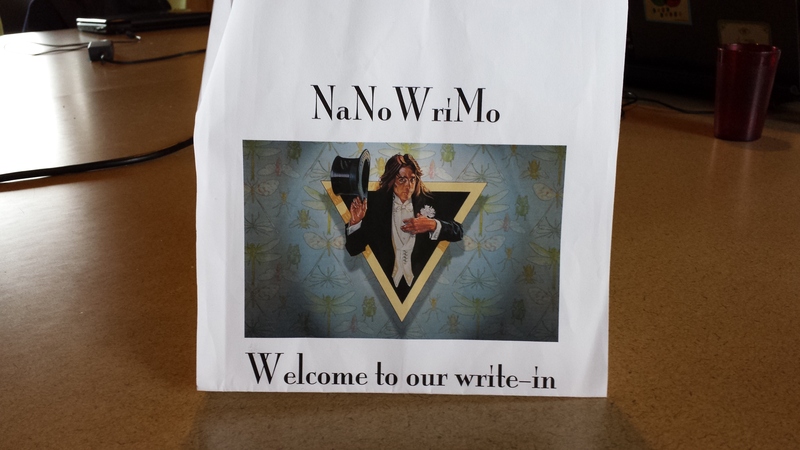 If you’re a Twin Cities WriMo, look for this sign at each of the stops on the Traditional Tour, 14 hours of NaNoWriMo goodness today, Saturday 22 November 2014. 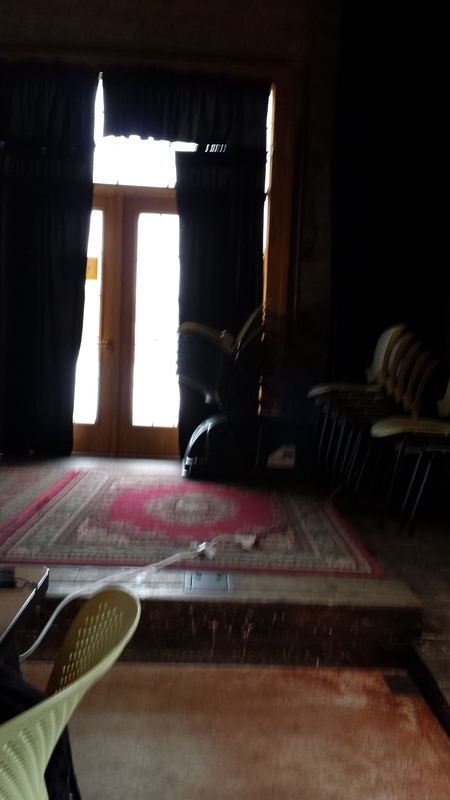 Performance stage at Depot Coffee, Hopkins MN. Last year my bad back required me to use this lovely rug as a recumbent work station. I’ve reached the point in the novel where my hero is launched on his hopeless mission to eliminate an emissary from the alleged space pirates, who has already potted three or four professionals. Now that I’ve realized that the Romance with Rayguns actually is the same novel as The Fourth Prime, story is bopping along nicely. Excerpt follows (raw and hot off the press). The pilot swung the carry-all bag up into the passenger compartment, then handed Hernan up with scarcely more ceremony. Once more the skimmer screamed into the heights; once more Hernan looked out the canopy to the vertiginous drop to the waves of the Inland Sea. The storm front was moving in, and in half an hour the Lesser Islands would be lost in a curtain of rain. The pilot raced for shore, outrunning the storm by a hair, then turned sharply to follow the river-valley to Karisalay-Prime. The skimmer came to rest in the landing-bays at the Shipyard, and Hernan scrambled out, swinging the carry-all over his shoulder. His first day as a Shipwright’s Apprentice, what he had contemplated with happy anticipation, began with little ceremony. As the rainstorm pounded down outside, he and the others received their regulation coveralls, with the shoulder-patch of the Shipyard and the silver piping to indicate their training status. They walked on the tour of the Shipyard, got the safety reminders about the welding equipment from the operators of same, met the trainers who would be working with them and with the commissioned Crew of the new Ship. If only he were here in earnest … well, not even that. What he’d hoped for had been taken away and returned as a ruin of itself. Temn had spoiled it. His own researches had spoiled it. He knew now that the magnificent Ships had minds both human and artificial. They had destroyed the Melisand he knew to make such a ship. Which might be, and probably was, a sham designed simply to kill him. They received their assignments to rooms in the apprentices’ wing of the Shipyard guest-house. Single rooms, tiny as ship’s cabins; they weren’t expected to do more in there than read, sleep, and wash. The common area was far more spacious and well-appointed, with room for conversation and study; they took their meals in the guest-house refectory. It didn’t take him long to settle his meager possessions there. Though there was one last touch needed: an excuse, he told himself, to cover his uncommunicative manner, which might read as surliness to his fellow apprentices. He took the white silk sash from the outfit Temn had given him, tore it into long strips, twisted it into the shoulder-cord-and-rosette of a mourning-token, and tied it off with another strip of the same silk with a triple blood-libation on its end. Mourning and heart’s-blood, that sign meant: a deep, fresh, and unresolved loss. Anyone, from anywhere on Karis, would respect that sign and not initiate conversation until he was no longer wearing it. Then, since he’d rather not be alone with his thoughts, he joined the other apprentices as they trooped down to the refectory for the evening meal, and afterward sat around in the common area talking into the evening. Once he would have tried to make friends, but this was temporary. Everything was temporary, and could be taken away on short notice. This entry was posted in NaNoWriMo, Writing and tagged Excerpt, NaNo 2014, NaNoFeed, NaNoWriMo, Romance with Rayguns, Science Fiction. Bookmark the permalink.